The BJP and its ideological parent RSS may have chalked out strategies to woo the Dalits, but when party president Amit Shah reshuffled his key team for the organisation, he failed to give them a representation. 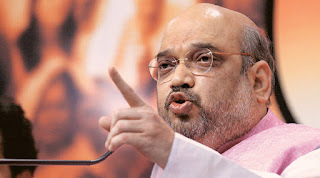 Dalit leaders in the party said that when Shah filled the national office-bearers’ posts vacated by those who were inducted into the Union government, among whom two were Scheduled Caste leaders – Thawar Chand Gehlot and Ram Shankar Katheria, he did not include new leaders from the community in his team. “BJP has been talking about giving the Dalits their dues. But the leadership ignored the Dalit leaders who have been working hard for the party,”said a party leader. Shah recently made 10 appointments to his key team. Among 37 office bearers – vice presidents, general secretaries, joint general secretaries and secretaries – who were appointed in the recent party reshuffle, there is no Dalit leader. “There are OBC leaders and tribal leaders. After (Mukthar Abbas) Naqvi became a minister, the party has accommodated Farooq Khan in the team,” a party MP pointed out. With an eye on the Dalit support base, crucial in poll bound Bihar and in Uttar Pradesh where the BJP is keen to repeat its stunning performance in the Lok Sabha elections, the party had organised a massive programme in Patna on Dalit icon B R Ambedkar’s birth anniversary. The RSS had also chalked out a plan to end caste discrimination and to incorporate Dalits into the Hindu fold.